1885. 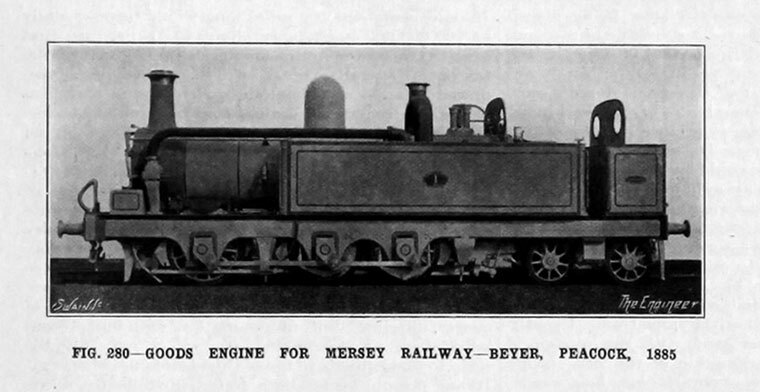 By Beyer, Peacock and Co.
1886.Tank Locomotive for the Mersey Tunnel Railway by Beyer, Peacock and Co.
1922. Train Indicator, James-Street Station. 1922. 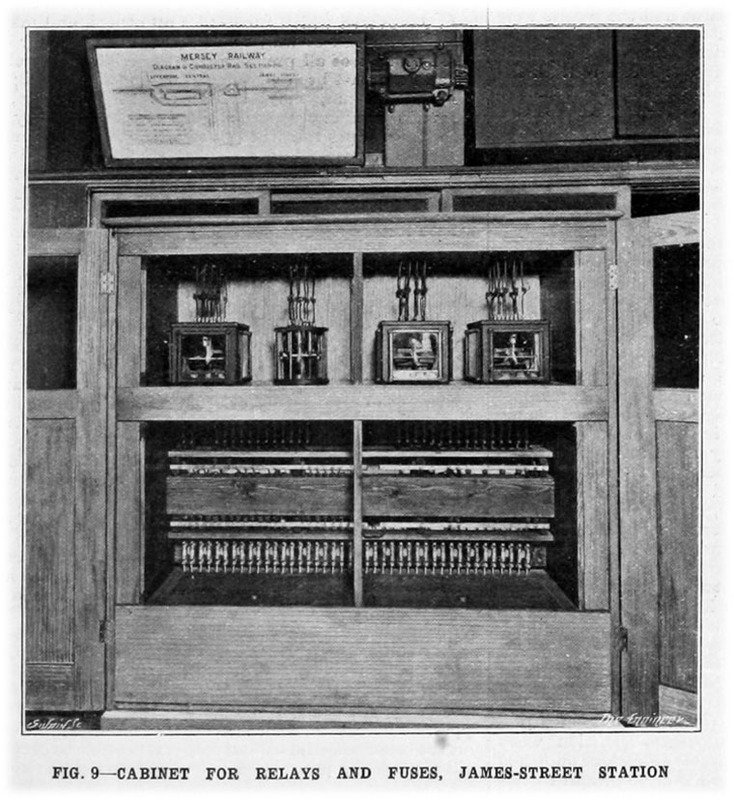 Cabinet for Relays and Fuses, James-Street Station. 1922. 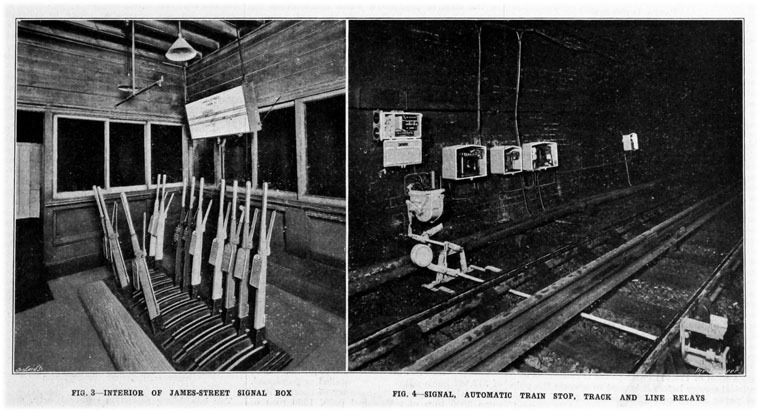 Signal Box, and Track. of Worcester House, Walbrook, London. 1886 It was the first tunnel built under the river. It was constructed by John Waddell, who had been sub-contracted the work by Major Samuel Isaac. 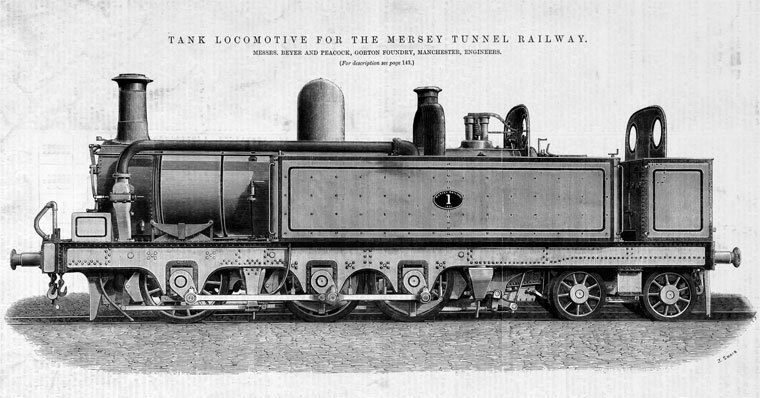 1886 The company was incorporated to construct a railway connecting Liverpool and Birkenhead, by means of a tunnel under the River Mersey. 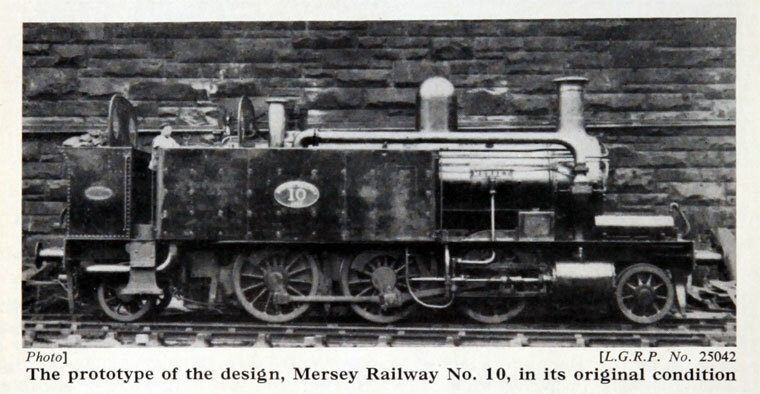 1886 The Mersey Railway opened between Green Lane station in Birkenhead and James Street station in Liverpool in 1886, via Birkenhead Central and Hamilton Square stations, both in Birkenhead. 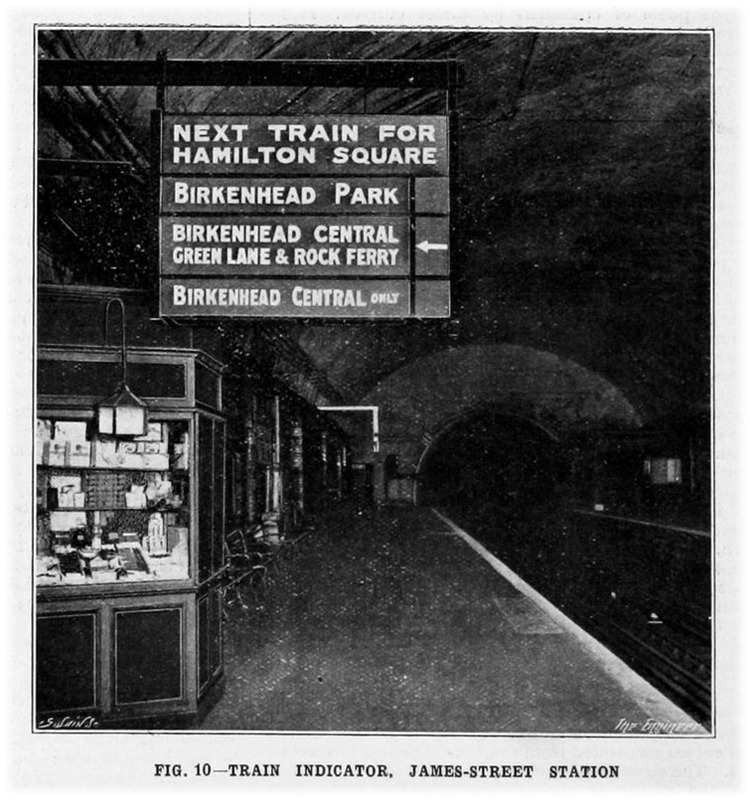 1888 a branch to Birkenhead Park station opened, with a connection to the Wirral Railway. 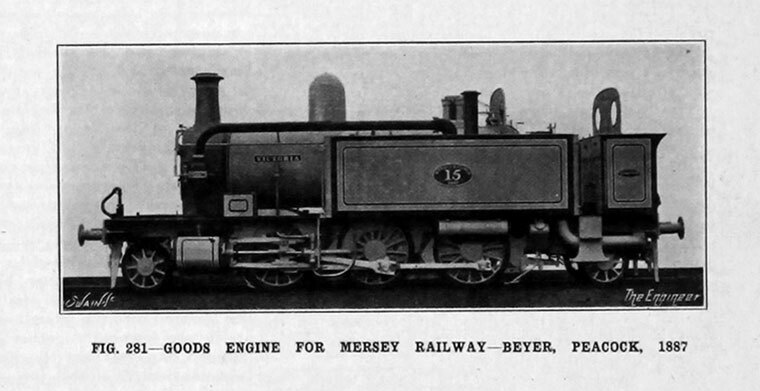 This was followed in 1891 by an extension from Green Lane to Rock Ferry with a connection to the Chester and Birkenhead Railway. 1892 the tunnel was extended from James Street to a new Low Level station at Liverpool Central. The total length of the tunnel was 5,029 m and by 1890 it was carrying 10 million passengers a year. 1903 The line was electrified, becoming the first railway in the world to change over completely from steam to electric power - it sold ten of its steam engines to the Pontypridd, Caerphilly and Newport Railway. It was originally electrified with a fourth rail system, which was later replaced by a third rail system. 1922 Mr Joshua Shaw was the general manager. 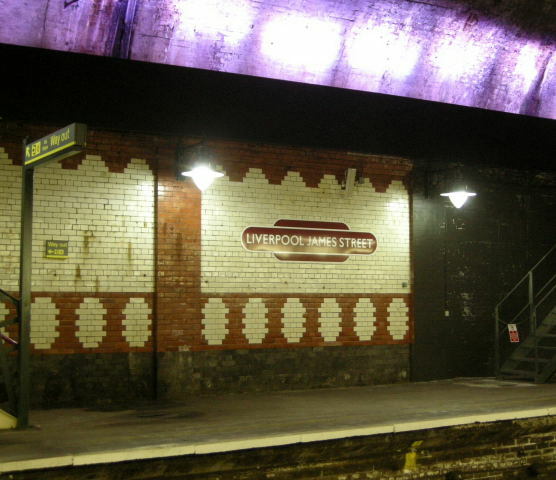 The tunnel and railway are still in use today as part of the Wirral Line of the Merseyrail network. The Mersey Tunnel was designed by Sir Charles Fox, and the design was carried out by his son, Douglas Fox, a Civil Engineer who was joint engineer to the Mersey Tunnel Company (set up in 1866) with James Brunlees. Douglas Fox was later knighted for his work on the project after it's official opening by the Prince of Wales , later King Edward VII. This page was last edited on 9 March 2016, at 08:06.